By Phil Gaffer QFP, Franchise Sales and Business Development Manager, Papa John’s. This summer Papa John’s celebrated opening its 400th UK store. Since Papa John’s was founded in the U.S. in 1984, over 5,000 stores in more than 40 international markets and territories have been set-up. Many of these are run by multi-unit franchisees. The attraction of running more than one Papa John’s is clear: more stores offer franchisees the chance to develop an ever-growing income stream. Franchisees can draw revenue from several stores to produce a healthy profit while also re-investing, to build a portfolio of assets. For this reason, many of our franchisees have more than one outlet, some ambitious franchisees in the UK run up to 20 stores. For several years, Papa John’s has encouraged successful franchisees to invest in multiple stores with incentives – for example franchisees only need to put in 30 per cent cash up-front. Then the income generated by the new store is used to fund the next outlet and the next, while the capital is maintained. The prospects I speak with get excited about running multiple stores. The financial return for having multi-stores can, along with the crucial ingredient of ‘hard work’, provide a six-figure income. There are certain economies of scale to be gained when opening multiple stores too. Firstly, the learning curve becomes less steep with each outlet that opens, as processes are better understood and executed. Staff recruitment and training becomes more straightforward the more people who are taken on. Advertising costs for personnel can be reduced by using less page inserts for multiple regionally based outlets. Similarly, experienced staff can move to a new store opening nearby to help new recruits hit the ground running, once the opening date is set. Buying resources spread across multiple units can help minimise costs too. From stationery to toiletries, bulk buying can offer cost-savings across the board compared to running just one outlet. Franchisee, Sukhbir Gill, worked at a rival pizza firm for eight years prior to joining Papa John’s. Along with his business partner Lakhwinder Singh, Sukhbir now runs five Papa John’s including Skegness, plus his most recent opening in Sunderland. Sukhbir explains: “The Papa John’s franchise was attractive because it is growing so rapidly and so there are many opportunities for expansion. Papa John’s head office staff have been particularly supportive. “The whole team is motivated and they have been able to provide some very good incentives to help us grow our portfolio of stores to five in a very short space of time. These incentives include royalty reductions and deals on equipment, plus help with marketing to ensure we tasted success quickly. “Over the holiday season our Skegness store really picked up in terms of sales, which is really exciting and is a great sign for the future of our business. 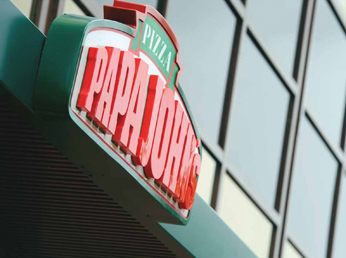 Demonstrating our commitment to working in partnership with our franchisees to help them grow, Papa John’s proactively supports franchisees financially, plus offers incentives to help expansion. Papa John’s is one of the largest pizza companies in the world and has opportunities for franchisees throughout the UK. Help is provided with location selection and full turnkey opening of stores. As a franchise, the company supplies all the assistance needed to get your successful Papa John’s up and running.